Autism’s prevalence has soared within the last ten years. Ten years ago, autism was diagnosed in approximately 1 in 166 children. Today, it has increased more than 100% as it is prevalent in 1 out of 68 children. Direct screening of children indicates that autism may be more widespread than current statistics suggest. Autism Speaks, an organization founded ten years ago to raise awareness and funding for research into Autism studies conducted a study in South Korea where it screened children in South Korean schools. The study concluded that 1 in 38 children were affected by Autism. The majority of the children were previously undiagnosed. A similar study is currently being worked on in conjunction with the CDC in the United States. Early intervention makes a difference. It is now possible to have an Autism diagnosis by age 2. Early screening is important so that services can be administered. Early intervention affects underlying brain development and activity and may also reduce the need for interventions later in life. Behavioral therapy for autism may be essential. Behavioral issues may be present in a child diagnosed with Autism. Behavioral therapy can have significant benefits in the development of a student with Autism. Health coverage for behavioral treatments is now available in 38 states. Many families can now benefit from behavioral treatment for children diagnosed with Autism. One out of three persons diagnosed with Autism cannot speak. Assistive technology is necessary for one third of persons diagnosed with Autism to be able to communicate. These devices can be very expensive. Efforts are underway to help obtain insurance coverage for such necessary devices. It is possible for a nonverbal child diagnosed with Autism to eventually speak. Appropriate services and therapy can make it possible for a nonverbal child with Autism to speak. It is important to communicate with the school district and providers regarding the child’s needs and to obtain evaluations to determine the needs of the child. Many children with Autism suffer from gastrointestinal issues. Gastrointestinal issues and allergies to foods are common in children with Autism. The pain that results can exacerbate behavioral issues. It is important to understand the child’s gastrointestinal issues and make others who work with the child aware so that the issues can properly be managed, for example, following gluten- free or lactose-free diet. Children with Autism often have trouble sleeping. Any trouble sleeping or sleep disturbances should be discussed with the child’s doctor so that interventions can be taken. The information should then be relayed to the school if the child is school-aged so that an appropriate program can be provided, such as planning instruction in the morning if the child gets sleepy in the afternoon. Identifying the best services for someone with special needs can be daunting. We can help you navigate the system, understand your child’s legal rights, and establish the financial foundation that will enable as much independence as possible. Our goal is to empower families with the tools they need to advocate for their loved ones—for a free and appropriate education, public benefits, and social services. The Neighborhood Network of New York (NNNY) is set to develop an innovative, community based service network for adults with autism, thanks to a grant from the New York State Office for People with Developmental Disabilities (OPWDD). The program will provide individualized services to clients, including remote support technology and community activities. NNNY will launch a prototype of the program to serve Medicaid beneficiaries in Westchester County. In time, the organization will develop protocols to launch similar networks throughout the state. The NNNY program is intended to provide greater independence and empowerment for adults with autism through supports within the community, including remote support in private apartments. The program will be more affordable than traditional models, while also providing services which are appropriate to the individual’s needs and more fully integrated into the larger community. With a record 1 in 68 children diagnosed with Autism Spectrum Disorder, as of 2010, services like these will be essential in serving an unprecedented number of children with autism reaching adulthood. This transition often represents a challenge for people with autism and their families, as they leave the support of parents and the school system and struggle to identify appropriate supports within the adult service system. Traditional full service options, like group homes and day services, are expensive, and for many individuals with autism who do not need such a high level of staffing, unnecessarily restrictive. These traditional, segregated models may represent a stark contrast to the integration into the school community that the individual with autism previously experienced in school, where they were mandated by law to be educated in the Least Restrictive Environment, together with students without disabilities to the maximum extent appropriate. The NNNY program will take a three-pronged approach. Individualized Living Services for All Levels of Need allows clients to live alone or with a roommate in apartment complexes where both clients and non-clients reside. Clients who need more support may live with a professional family. All NNNY homes will include Proprietary Remote Support Technology that can be used to monitor residents’ safety and provide real-time coaching. Finally, the Communiversity will provide lifelong learning, teaching job skills and life skills along with community and recreational activities. Learn more about our services by visiting www.specialneedsnewyork.com. More than one third of children with autism who wander are never or rarely able to communicate their names, address, or phone number. As a mother of a child that has been severely affected by autism, I’ve had to deal with my son wandering on more than one occasion. After these awful experiences, my husband and I wanted to create a simple way to allow people to help our son if/when he is lost or wandering. 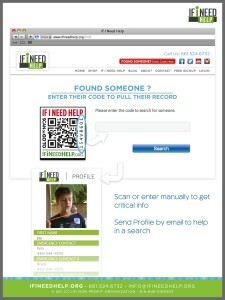 So, we started a non-profit organization called If I Need Help that creates personal wearable QR codes. QR codes are two dimensional barcodes that can be scanned by a smartphone or mobile device to hard link to or “object hyperlink” to a specific set of information or website. The QR codes we develop at If I Need Help are scanned or manually entered. From there, it links to a live profile to your child that can be edited in real time. 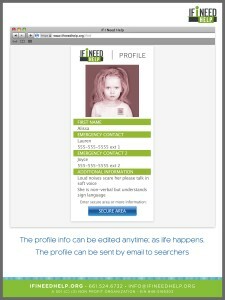 The profile can be emailed to others when a search is needed. The barcode can be printed out with the free membership. We also offer personal codes on patches, pins, clips, ID tags for shoes, necklaces and ID cards. This way of identification and information is now also helping incapacitated people with mental illness, memory care or with physical conditions in which they may need help during critical situations. Please go to www.IfiNeedHelp.org to learn more. 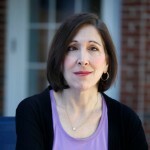 Our guest blogger this week is Liane Kupferberg Carter, Writer, Journalist, and Autism Advocate. It’s 51 degrees out. Which means my 21-year-old son Mickey is wearing shorts and sandals. “It’s too cold!” I protest. “But it’s May.” Well, yes. I remember battling my own mother, who forced me to wear skirts with scratchy crinolines (yes, I’m that old.) Is that what it’s like for Mickey when we ask him to wear clothes that itch or cling or rub, or bother him in ways we don’t even know, because he can’t parse the particulars of his discomfort? “Because I hate it,” he says. I know how miserable I feel wearing Spanx. Is that how he feels about dress pants with a belt? Loafers? A blazer? Worst of all—a dreaded tie? “I want regular clothes,” he says. I respect his sensory issues. I want to honor his right to choose what he wears. Unfortunately, there are just some circumstances where you can’t wear what you want, and it’s not only due to weather. Sometimes respecting his right to choose smacks up against the need to dress appropriately, whether it’s a volunteer job, visiting a house of worship, going on an interview, or hiking with his day hab group. It’s dangerous to climb a mountain in sandals, and disrespectful to go to synagogue in a t-shirt and shorts. Why am I making a big deal about shorts and sandals? Am I worried someone will say, “How can you let him go out that way?” and judge me as a bad parent? Yes, it’s chilly, but he’s not going to die of exposure if he goes out underdressed for this weather. Maybe if he does realize it’s cold or wet and he’s not as comfortable as he thought he’d be, he will learn from it, and next time wear something more suitable. I try not to intervene with his choices unless health or safety is at stake. I may say, “What do you think your friends will be wearing today?” or “I don’t think those colors match,” but I won’t stop him if he’s really set on the combination. It’s a fine line between encouraging self-expression, and letting him leave the house wearing clothes that may make him an object of teasing or ridicule. Haven’t I made similarly inappropriate choices? Worn high heels out of vanity, when I should have opted for more comfortable or practical footwear? Shivered in a thin summer dress I wanted to show off, instead of wearing something more sensible? Mickey is a young adult now. He is chafing against our restraints. His struggle to pull away from us is developmentally appropriate. The business of adolescence and young adulthood is to separate from your parents, to find your own way in the world. Part of growing up for anyone is learning to make—and live with—one’s own choices. He starts out the door in shorts and sandals, then goes back to his room. When he emerges, I see he has added a baseball cap and sunglasses. “I’m going to sunbathe today,” he says. “Pack a sweatshirt,” I say. He doesn’t. “I look handsome,” he says. “Very cool,” I agree. And resolve to say nothing more. Because it’s his choice to make. This isn’t about autism. 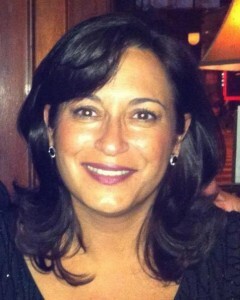 Learn more about Liane by visiting her website or friend her on Facebook, and follow her on Twitter. Is this article of interest to you? If so, please LIKE our Facebook Page by clicking here or follow @Littmankrooks on Twitter. Learn more about our special needs and special education services by visiting www.specialneedsnewyork.com. On January 10th, Governor Cuomo signed into law a bill which establishes a new state license for providers of applied behavior analysis (ABA) services to individuals with autism. ABA represents the leading evidence-based therapy for individuals with autism and other developmental disabilities. ABA, usually a one-on-one treatment method, focuses on assessing the environmental influences on behavior, assessment-based intervention, and data-based decision making. The new law will help individuals and families find quality ABA providers who have met stringent academic and training requirements, while also ensuring state regulation and continuing oversight of these providers. The new law creates a new state license for behavior analysts (with at least a master’s degree) and a new state certification for behavior analyst assistants (with at least a 4-year college degree), with a protected scope of practice. According to the New York State Association for Behavior Analysis there will be two different processes. The first process, which will be available from January 10th, 2014 to January 10th, 2016, allows an individual who is certified by the Behavior Analyst Certification Board (BACB) to become licensed or certified (assistants) if they fill out and satisfy the character and fitness requirement and pay the fee ($200 license; and $170 certification). Second, the regular licensure process begins on July 1, 2014 and is available for anyone who does not have BACB certification. However, if an individual obtains BACB certification after July 1, 2014, they can still apply through the shorter process which will be open until January 10th, 2016. The law goes into effect on July 1, 2014, except that individuals who are certified by the BACB will be allowed to apply immediately to the New York State Education Department for licensure or certification, provided they satisfactorily fulfill the character and fitness requirement and pay the required fee. The new law represents an effort to reduce the out-of-pocket expenses paid by the families of those with autism. 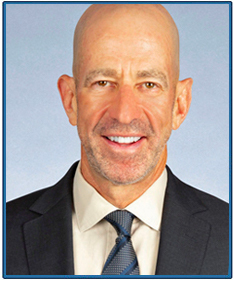 The law builds upon New York’s insurance reform legislation, passed in November 2012, which requires state-regulated health plans to cover ABA. The insurance reform legislation required that ABA practitioners obtain a state license in order to qualify for insurance reimbursement. Because New York has no ABA license, the requirement effectively blocked the ability of many families to use their new insurance coverage. The new law (S.4862) now supplements the insurance reform regulation by providing for the state licensing process. For more information, visit our website, www.specialneedsnewyork.com. Clearly, parents of a child with a developmental disability experience stress far beyond what most parents of neuro-typical children experience. In fact, a recent study noted that mothers of children with autism experience as much stress as combat veterans. I didn’t need to see the data to believe this. I am the mother of a 9 year-old neuro-typical daughter, and a 13 year- old son who is diagnosed on the Autism Spectrum, along with ADHD and anxiety. When my daughter started getting older, I noticed how easy it was to do things with her, compared to my son. This is when I began to realize how different and challenging my life was compared to the average mother. Since many children with developmental disabilities require a tremendous amount of one-on-one support, it’s difficult to take them on basic errands or to places where a child may have to sit for a period of time. Many parents take for granted the fact that they can bring their typical children to appointments or make a quick run to the store or send their child into the yard to play so they can get things done in their home. Parents of children with disabilities cannot often do this. The most basic of tasks – the supermarket, the pharmacy, a haircut, or a visit to a friends’ home – can be stressful, frustrating or simply avoided. Too often, parents are homebound and lose patience and time with their other children and relationships with family and friends suffer. I did not want to feel that I had to escape. I wanted to be a better mom, a healthier mom, a happier mom. I wanted to feel rested in order to enjoy the times I would be taking both of my children on an outing and to have some time to myself as well, to build and maintain my own relationships. I required time during the week or weekends to engage in activities without the stress automatically attached to each venture. I needed someone to engage my son and keep him properly occupied so I could have some time for whatever I needed to do. The good news is help is available for parents in this situation. If you are married or a single parent, respite care can help you maintain or build a relationship. It also benefits the siblings and allows them to access your time and attention. It allows for down time to re-group and re-energize yourself. Many parents feel that our needs are not as important as our children’s needs. They are! The stress, anxiety, frustration, anger and solitude aren’t healthy and do not help make you a stronger parent. The goal of respite care is to provide relief to parents so they can find free time to take care of needed tasks or simply to maintain balance. The Office of People with Developmental Disabilities (OPWDD) Home and Community Based Medicaid Waiver may be an option to assist you in accessing this service through Medicaid, despite parental income level. There are limitations to the hours you are approved for, but even a few hours a week can make a significant difference in your family’s quality of life. I had always known respite care was available but had a difficult time finding a provider and, quite frankly, the thought of looking for someone on my own was daunting. I am so happy that I didn’t give up because since hiring my respite worker almost a year ago, I have never looked back. In fact, it has prompted me to make additional changes in my life that have benefited not only myself, but more importantly my children. I’m able to run out of the house at the last minute for something at the market, give my daughter some well-deserved attention, enjoy a bath or work on my personal relationships. My respite worker helps with homework and interacts with my son by playing games or doing some outdoor activities. This time not only allows me to have some freedom but provides the necessary one-on-one interaction my son requires. It also provides him with healthy alternatives to play. He’s no longer sitting in front of video games or movies, which in all fairness, may be the only respite I was getting. I challenge anyone to try to perform the daily tasks parents have to accomplish while simultaneously providing the constant attention required for their child. It’s impossible! I cannot imagine how I was able to do it for so many years without this help. It’s important for every parent to know about the Medicaid waiver and the many services it provides. The initial set up or application process may seem daunting but the reward is tremendous. Once your child is found eligible for OPWDD, you will be directed to attend a Front Door Session for individuals and families of people with Developmental Disabilities. Here, you will learn about the different services OPWDD offers and how you can obtain respite services through the Medicaid waiver or through the many different Family Support programs offered throughout New York State. Nanette Saturn is an educational advocate with Putnam Independent Living Services, a satellite office of Westchester Independent Living Center. She is a mother of two children, one of whom has autism. Parents of children with autism spectrum disorders often experience high levels of stress and marital problems when compared with other parents. Much of this stress is the result of the greater amount of caregiving needed when raising a child with autism. A recent study shows that being able to take a break from caregiving, even just for an hour per week, decreases stress and improves the quality of a marriage. The study was published in the Journal of Autism and Developmental Disorders. Researchers surveyed the parents of 118 children with autism spectrum disorders and found that the number of hours of respite care per week was directly related to better marital quality. There was also an association between respite care and a reduction in stress. About 64 percent of the children in the study spent time with a respite care provider, such as grandparents, other family members, babysitters and community agencies. The study found that for every hour per week of respite care, there was less stress and better marital quality. The researchers said that it is important for supports for respite care to be developed for families raising children with autism. The study adds to what is already known about the importance of respite care for parents of kids with autism. A study last year found that children with autism had a reduced risk of psychiatric hospitalization when their parents were able to take advantage of respite care. For more information about our legal services, visit www.specialneedsnewyork.com. This post was featured on the blog for myautismteam.com. With each new year, this is a time to take stock of your accomplishments, or ponder those projects that will make it to the “to-do” list in 2013. And no New Year is complete without resolutions. Resolutions can take many forms; from the above mentioned project list to personal improvements in ourselves. At MyAutismTeam, we wanted to hear from the parents about their own resolutions. We surveyed over 35,000 parents on MyAutismTeam about their resolutions and what they are envisioning for 2013. One of the resounding resolutions for parents this year will be to take a moment for themselves. From making an effort for laughter to making time for spouses and exercise, parents recognize that they give their best to their children when they are at their best. While simple in theory, such small acts go a long way, as a study from the Journal of Autism and Developmental Disorders has shown that parents (mothers in particular) are prone to feeling a sense of chronic stress that is similar to that of soldiers in combat. * This stress can often translate into health issues leading to additional stress, etc. However, parents are taking note. In an effort to avoid and reduce stress, parents are choosing to focus on the positive. 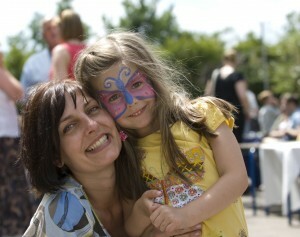 Concentrating on their children’s strengths and new therapies, parents are choosing to make 2013 a time to learn. In a year when autism was front and center, parents are also taking action and vowing to be stronger advocates for their children and more engaged in their progress. The top ten resolutions from the survey are listed below. I will develop my child’s areas of strength. I will take things one day at a time. I will be a stronger advocate for my child at his/her school or with healthcare providers. I will explore new therapies for my child. I will be part of a strong social network for emotional, social, and informational support. I will make more time for my spouse and myself. I will start looking at things from my child’s perspective. I will manage my own anxieties about social situations with my child. I will be vigilant in monitoring and managing my child’s progress. In the busy days ahead, don’t forget your resolutions to help you get through to the next. Did your resolutions make the list? If not, share them with MyAutismTeam at http://www.myautismteam.com today. For more information on special needs planning or special needs advocacy, please visit www.specialneedsnewyork.com.